Borderers are being asked for their views on a project that could see more golden eagles soar in Borders skies. The initiative – known as the South of Scotland Golden Eagle Project – has been pledged more than £1 million from the Heritage Lottery Fund, and has the backing of the Scottish Government. It aims to boost numbers of the iconic bird in Dumfries and Galloway and the Borders. Currently, there are only two to four pairs, with limited nesting success. It is believed there is habitat for up to 16 pairs. The project’s organisers are now keen to hear local opinions on the initiative – which could see eagle chicks raised and released in the Moffat Hills and various locations in the Borders. 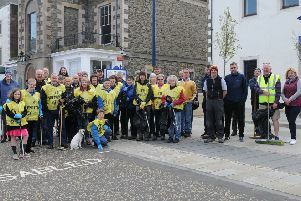 They have already launched an online survey to gather as many views as possible, and are hosting public meetings and drop-ins in Peebles on September 26 and Selkirk on September 27. “We’d like to hear from as many people as possible,” said project manager Cat Barlow. “We think this project is incredibly exciting. A revived population of golden eagles offers great opportunities for tourism and wider benefits for people and nature in the south of Scotland. Presentations will explain what is proposed and look at the successes of similar schemes elsewhere in the country.